Currently parked up in the Peaks enjoying the view having visited a luthiers workshop in a stunningly pretty setting. New bass in the boot and it’s a work of art. Have you just been to Shuker’s? I seem to remember reading something about a Shuker recently. Conference calls all the way there and back for work, but I managed to get half an hour in Jon Shuker's workshop tucked away near Hope in the Peak District. It's such a beautiful setting..
And the bass? 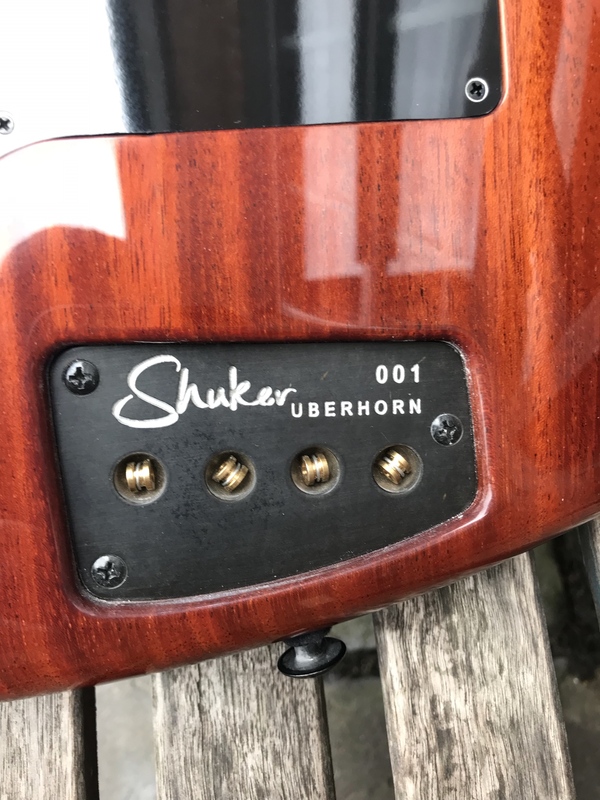 It's a Shuker Uberhorn Fretless 4. It has piezo bridges with a ghost preamp, and a magnetic pickup under the fretboard in the P position. He couldn't remember exactly what it was - but I tried it in the workshop and it's a fascinating solution to a balance issue. The Ghost piezo system gives a really really rich and lovely sound - it's basically like a rich P sound, with strong upper bass and some nice highs, but with the upper mids rolled off. The magnetic pickup is voiced for mids - on it's own, it's like a mid-heavy P, but with the piezo as well it's like a foghorn! Huge, deep, rich and loads of harmonics all over the shop!! There controls are logical - a switch for magnetic, both, piezo, then volume for magnetic, volume for piezo with a push pull "bright" control, and then a 3 band EQ for the magnetic (cut/boost) and a 3 way frequency switch for the mids control. Really flexible. Really good. The neck was a total surprise. It feels about 42mm at the nut but might be less, but it has this brilliant slim carve which is really similar to the pre-CBS Precision neck - it feels great! More on this when I get to play it! Check me out - I'm a fretless owner. Ooer. That looks awesome. Congrats! What has caused the light parts on the top? Is that just the figuring in the wood? That gives me the uberhorn. That's an amazing-looking thing. 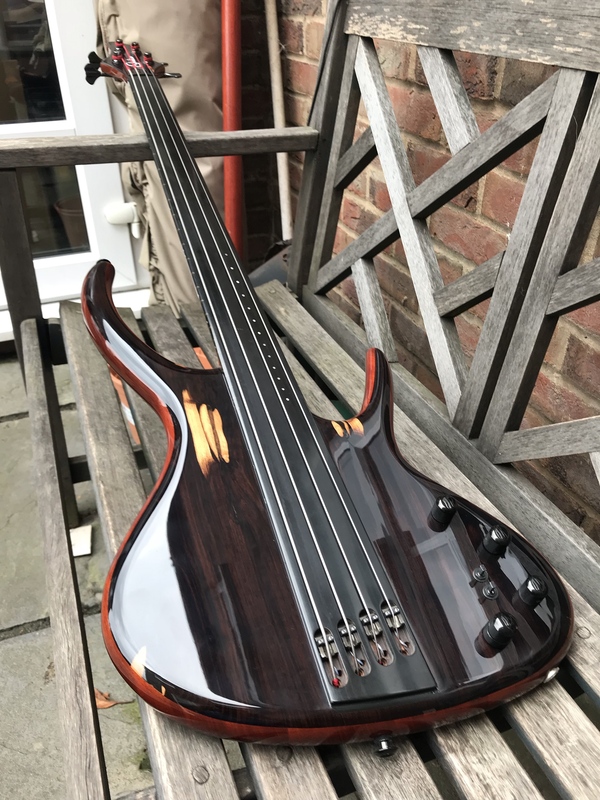 A glorious start to your fretless journey! What a lovely instrument. 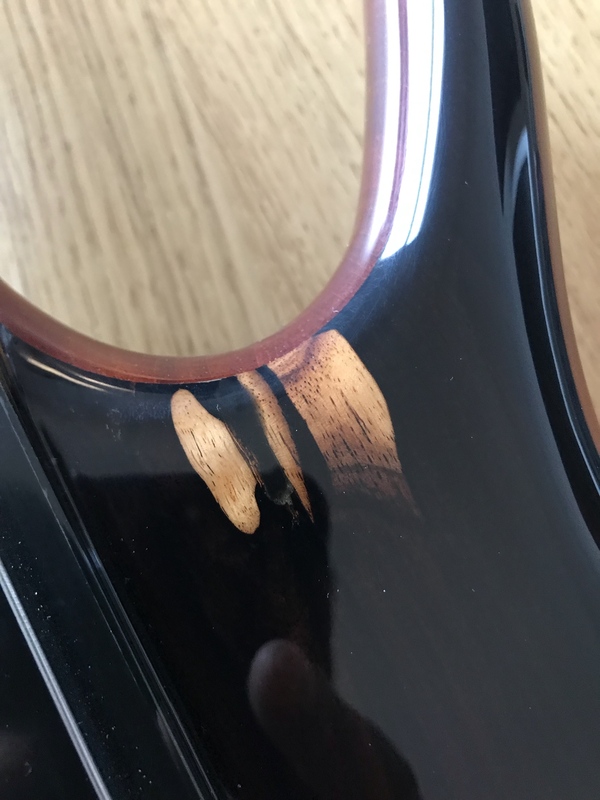 Tom Anderson build quality! Enjoy. Thanks all! I’ll have a play tonight and report back..! I thought that must be some sort of signature mark in the finish, so it's natural? Beautiful instrument, it has a real double bass vibe with the full length fretboard. I see your P bass collecting dust with this in the house. I thought that must be some sort of signature mark in the finish, so it's natural? That's absolutely beautiful, well done. One thing's bothering me a bit though, the name! ...I hope it doesn't sound like the beeper on a dodgy taxi. In a wow sort of way! Congrats. Just had half an hour off working. Decided to have a go. @JezWynd - looks like you might be spot on with your synopsis - going to be hard not to pick this up to play as first choice...! 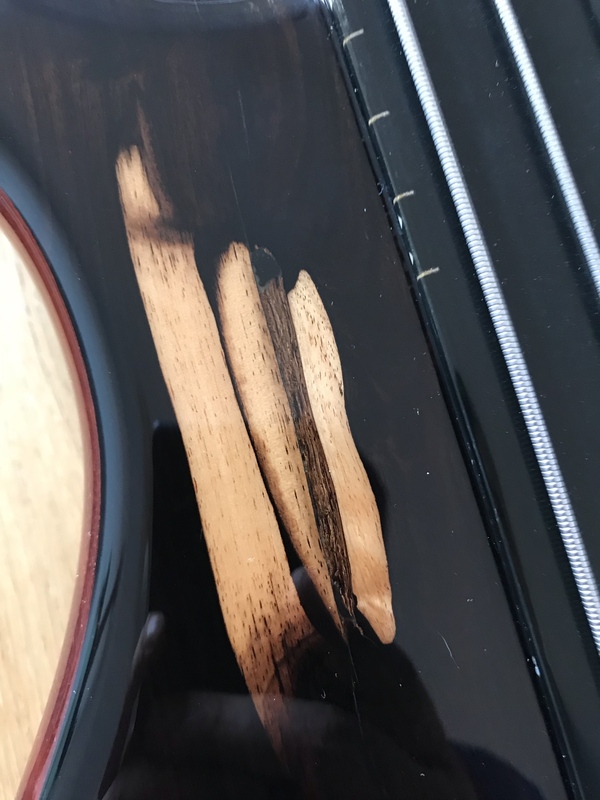 Looks like a bloody big spider has soiled the fingerboard. Try not to rely on visual cues such as the fingerboard edge markers. The viewing angle leads the eye to project the positional line across the 'board diagonally. Instead, find the pitch by ear. Practicing in a darkened room might help to develop accuracy. If/when you feel up to it, try to gliss double stops or chords. I’ll be measuring progress in months not weeks or days! Like I posted, if/when you feel up to it. You really weren't joking when you mentioned custom built and exotic wood, were you. Crap. Crap crap crap crap crappity crap crap. I am so glad I learned bass with thumb behind classic left hand. I am so glad I learned bass with a muting floating thumb technique. There’s no pickup to rest my thumb on in this one! But, it’s a progressive hard. Low down the board and lower strings is easier than high up the board on higher strings. It sounds like a bass, but it sounds so different to a bass. It’s incredibly addictive and so rewarding when you get it sounding right. 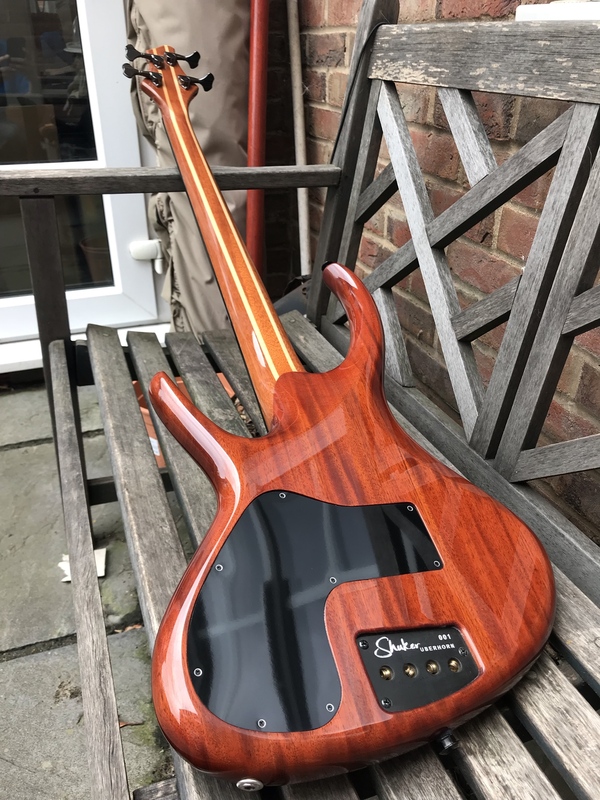 I *should* hate it, because it's just about the perfect example of everything I don't like about 'modern' basses - apart from having the proper number of strings - but actually I really quite like it . I wouldn't want to own it, but it's really beautifully designed and made.